These delicate chocolate flowers are made using our creamy milk and premium 64% dark chocolates. Each crystal-clear box is hand-packed with an alternating mix of 15 dark and 15 milk chocolate flowers (approximately 4 ¾ oz. ), for an artfully arranged display of molded chocolate at its finest. We roast and caramelize premium California almonds, then pan them in rich dark chocolate before finally dusting them in cocoa powder to create our exquisite Dark Chocolate Covered Almonds. 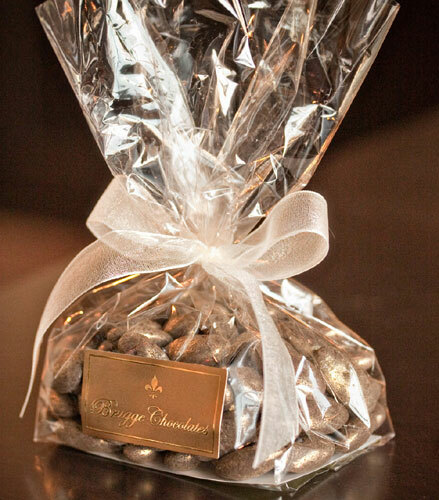 Each cellophane bag is hand-packed and tied with a ribbon (approximately 5 ¼ oz.). These gourmet candy bars combine rich caramel, toasted almonds, candied orange peel and candied ginger for a decadent taste sensation. Each bar is dipped in either milk or dark chocolate, and then decorated with toasted, sliced almonds. Two Florentine Bars come packed in a clear cellophane bag (approximately 1 ½ oz. ).